Grate cauliflower head on a cheese grater to create cauliflower shreds or “rice.” Or pulse in a food processor until rice consistency. Combine the shredded cauliflower, onion, salt, pepper and garlic powder, stir to combine. Shape into approx. 6 hash browns. Heat 1 teaspoon coconut oil over medium heat. Add hash browns to the pan and gently press down with a spatula to flatten, working to keep the hash brown together as much as possible. Cook for about 3-5 minutes on each side or until golden brown and cooked through. 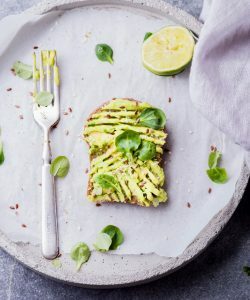 To make the smashed avocado, place ripe avocados in a mixing bowl and mash roughly with a fork. Add lemon juice, salt and pepper. Set aside. Spoon the avocado mixture evenly on top of cauliflower hash browns. Sprinkle over dried chilli flakes (dukkha or pepitas) and season to taste with salt and pepper. Serve! Tip: Paleo bread can also be used as an alternative to hash browns.